You can picture it now…. chilling out by your tent while enjoying a cool drink, then heading out into Edinburgh for some crazy and memorable Festival and Fringe action… all without the hassle of having to put it up and blow up a bed! Our Pre-pitched Village offers you a really comfortable stay in a perfectly pitched tent with beds included so all you need to do is turn up and enjoy your time in Edinburgh. Lovely 2 Person Pre-pitched Tent set up for you so all you have to do is turn up and make yourself at home. Choose between a Twin or Double bed configuration, with either 2 x single beds or 1 x double bed. Sleeping packs (sleeping bags + pillows) are available to book as optional extras. Perfect for a couple, friends or a single person to comfortably stay with us in Edinburgh, it has a spacious 2 person sleeping pod and a good sized porch area is great for fitting your kit in and making a brew. Unless you’re particularly small you can’t stand up in here! Lovely 4 Person Pre-pitched Tent set up for you so all you have to do is turn up and make yourself at home. Includes 2 x double beds as standard. Sleeping packs (sleeping bags + pillows) available to book as optional extras. 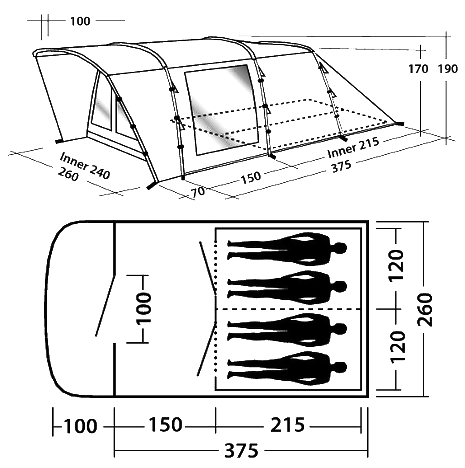 Has 2 separate 2 person sleeping pods and a communal standing height living area (great for getting ready, preparing food, extra storage or playing a game of cards). Perfect for a small group of friends, a couple of couples, a family or as a roomy more premium space for 2. If you have young children you may also be able to squeeze an extra one in! Rented sleeping kits are to be returned to Check In or left in your tent upon departure. We have a beautifully landscaped spot at Edinburgh Festival Camping called The Countryside Area at The Royal Highland Centre. Read more about the available facilities here. Great nights camping. We were made to feel really welcome by everyone, a good pre-pitched tent and great facilities. We had a fab time. Thank you.